The brave Chesterfield U18s' team, who reached the semi-finals of the English Hockey Tier 3 Cup. A superb performance against one of the sport’s leading clubs was not quite enough to earn cup glory for Chesterfield U18s on Sunday. 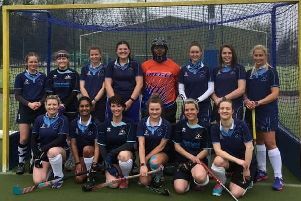 Chesterfield played their part in an enthralling match at Reading B in the semi-finals of the English Hockey Tier 3 Cup before falling to a 3-1 defeat. Coach Christian Battye, who had nothing but praise for the teenagers, said: “We put in an outstanding display. But we just lacked that bit of luck you need if you’re going to pull off an upset. “Reading were fantastic -- easily the best side we’ve faced at this level. So our lads should take great pride in getting to this stage. Roared on, Chesterfield held the hosts until conceding the first goal just two minutes before half-time. Reading struck again early in the second half before a goal from Luke Fishleigh ignited the tie and Chesterfield went in search nof an equaliser. Skipper Joe Morton had a shot well saved and Josh Beardsley was also denied by the ‘keeper. But despite some heroic defending, Morton’s side leaked a third goal in the dying minutes. CHESTERFIELD LINE-UP -- Ethan Fox, Ethan Doherty, Joe Welsh, Tom Bacon, Hugh Frazer, Joe Morton, Ryan Speed, Josh Beardsley, James Eades, Louis Johnson, Luke Fishleigh. Subs: Matt O’Brien, Sam Bryce and Callum Kendellen.